5 simple breakfast ideas that can be in your mouth in 5 minutes or less (unless you are a new mom, in which case there will be a future post for you). 2. Berry Blast smoothie – strawberries, blueberries, blackberries and raspberries (fresh or frozen), plain yogurt, and a little skim milk, blended until smooth. Think about adding a banana or a splash of citrus juice to brighten the flavors. Toast a slice of bread (my husband’s homemade bread, pictured, works for me!) 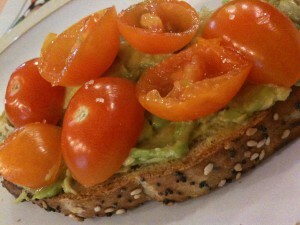 and top with ~1/8 of an avocado (mashed), chopped tomatoes and a pinch of salt and pepper. Ingredients: 1 multigrain tortilla, 2 eggs, shredded cheese, salsa or chopped tomatoes and an avocado. Directions: 1. Heat a non-stick pan and cook eggs flat like an omelet, whites only if desired. 2. Place the tortilla on a plate, cut the eggs in half and place on the tortilla. 3. Top with shredded cheese, salsa or chopped tomatoes and 1/8 of an avocado sliced into 3 pieces. Season with salt and pepper, wrap and eat. The simplicity of steel-cut overnight oats is worth repeating. Make the oatmeal at night, reheat and add your favorite toppings the next morning. 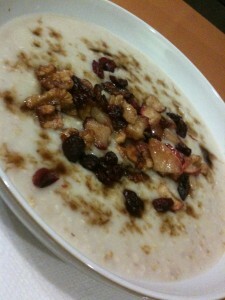 Another option is Bircher Muesli, with this recipe from My New Roots. Directions: Toast bread, spread with your choice of nut butter, top with banana slices. Eat immediately or let the toast cool for a minute, top with a second slice of bread, wrap it in foil and eat it on the go or at work. While I personally don’t use fruit as the star ingredient in my breakfast, it’s an easy, nutritious way to start the day. 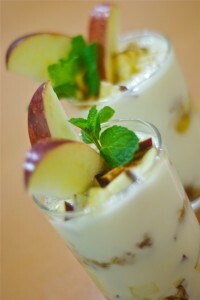 Simply chop and mix with yogurt, blend into a smoothie or eat it by itself. What are your favorite go-to breakfasts? Looking for a healthy grab-and-go, cold weather breakfast that can be changed daily? Look no further than the recipe below. 4. In the morning reheat in the microwave or in a saucepan on the stove. Add water or milk with reheating as needed. Whether you’re having guests over or simply want to change up your daily breakfast routine, this visually appealing, nutritious (and delicious!) 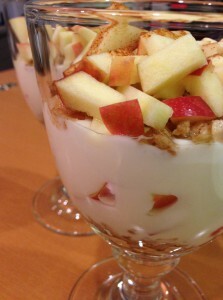 parfait is the way to start your day. Simply layer yogurt (Greek or regular, plain or vanilla) with fruit, berries, honey, granola, nuts or any combination of them, sprinkle some cinnamon on top and repeat!